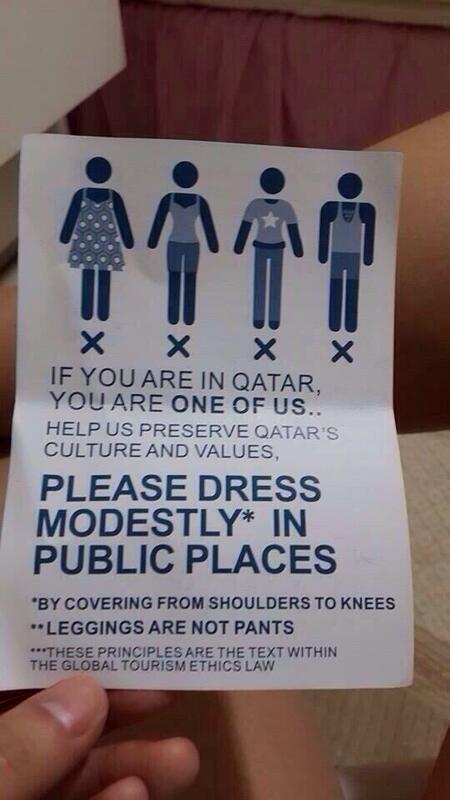 If you are in Qatar, you are one among us, is the amazing cry the Qatari women activist are using to promote dress decency among foreign tourist visiting Qatar. Given the football world cup in Qatar at 2022, the Campaign is being widely talked across all famous News sites across the world over Qatar’s message towards its cultural importance and its beliefs. Named as the grass-roots campaign, the Campaign will officially launch next month, according to Gulf News. It includes a brochure to be distributed to arriving visitors that details what sort of attire conforms to accepted societal standards. Dresses, sleeveless attire and other garments believed to reveal too much skin are considered bad dressing sense as per the campaign. Citing the Articles from Qatari constitution, the campaign says the standards are actually part of Qatari law in the state’s constitution, which reads in Article 57: “[A]biding by public order and morality, observing national traditions and established customs is a duty of all who reside in the State of Qatar or enter its territory.” Officially, Qatari state tourism recommends men and women “dress modestly as a courtesy to both Qataris and Muslims” in public places. “Reflect your Respect” spokeswoman Umm Abdullah told Doha News the purpose of the campaign is to encourage more interaction between vistiors or expats and Qataris. The Campaign, is hoping to reason with people’s attitude towards society highlighting the cancer grown in today’s modern world, where in the name of freedom, the right to society is breached. Always a hot topic in debate, most people would agree that bad dressing is the primary part of violence against woman today. I hope, by listening to Qatari women activist message, there might be some good chance of cultural unity that people across the world would be benefited with. Next: How to win an Argument?